A child's ability to learn how to ride a bicycle depends on her physical development, coordination, and mastery of gross motor skills and fine motor skills. Most children are ready to ride a bicycle by the time they are 5 years old, according to the U.S. Consumer Product Safety Commission. 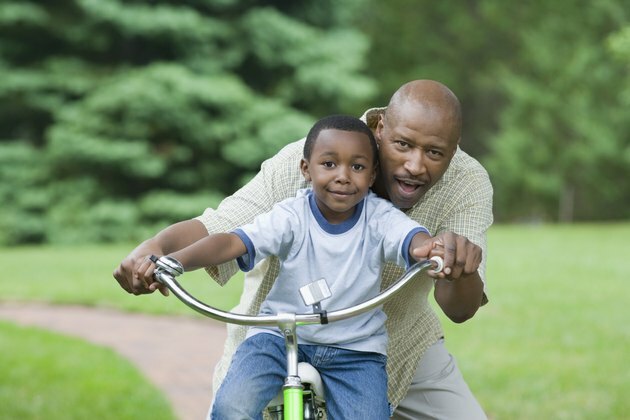 Your child needs a certain level of balance and coordination to ride a bicycle. Children who cannot walk steadily without support have not developed enough balance to use a ride-on toy, especially a bicycle. The physical factors that determine the age for learning to ride a bicycle are balance, rotational speed of the bike's wheels and propulsion. Training wheels can provide more balance as your child learns, and the act of pedaling, or self-propulsion, allows your child to control the speed. Children ages 3 and 4 years are in a period of significant gross motor skills development. They learn to balance on one foot; walk on their tiptoes; and climb, hop and skip. Three-year-olds can pedal, use a handlebar and operate three-wheeled vehicles, such as tricycles, but they do not have the balance required to operate a bicycle with only two wheels. Because of increased coordination and muscle control, some 3- and 4-year-olds are able to ride small bicycles with training wheels and can progress to riding without training wheels. Children in this age group need foot brakes since they are not yet able to safely use hand brakes. Children who are 4 and 5 years old lose interest in simple ride-on toys and are ready for the bicycles used by older children. Most 5-year-old children have the balance and coordination needed to operate a bicycle without training wheels. While 5-year-olds are physically capable of operating a bicycle, they might not understand the danger and possible injuries of riding near traffic or without a helmet. Children in this age group are at high risk for falls and injuries, which can often be avoided with adult supervision. Most 6-year-old children are physically able to ride a bicycle without training wheels and have developed a sense of how to avoid dangers and injuries. Your 6-year-old probably has the coordination required to use hand brakes. Children who are 9 through 12 years old are able to use hand gears and multispeed bikes, but they are likely to try high-risk moves, such as stunts, riding in traffic or riding too fast. Purchase the appropriate size bike for your child to ensure his safety. According to HealthyChildren.org, oversize bicycles are dangerous for children. The size of your child's bike should allow him to straddle the bike comfortably, leaving an inch between his crotch and the bar, with both feet on the ground. While seated on the bicycle seat and holding to the handlebars, your child should be able to place the balls of both feet flat on the ground. What Size Bike Does a Child Need? What Size Bicycle Is Best for a 6-Year-Old?